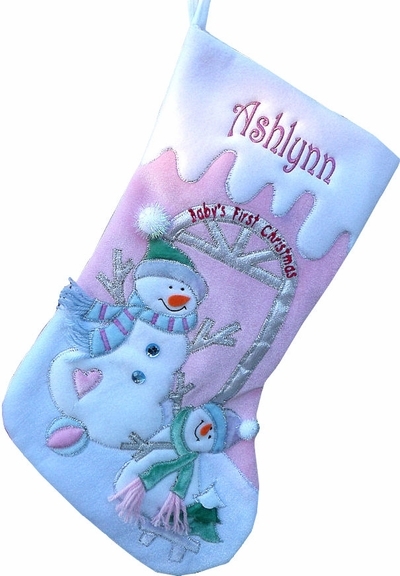 Home > >Shipping Rates & Times< > All Christmas Stockings > BABYS FIRST CHRISTMAS Stocking Cute Pink Snowman Large Velvet 21"
Large - Extra Large Baby's First Snowman Christmas Stocking in Shimmer Velvet for the Baby who only deserves the best.... SOLD 11-26-2018 We can embroider First name and a Year in baby pink metallic embroidery thread. The name is embroidered above the year. Baby's First Christmas Stocking personalized 20" Shimmer Velvet Pink Snowman - embroidered with pink metallic thread. with Baby's First Christmas on the Stocking and Baby's name and Year on the white cuff. On this stocking we can embroider year as well as the name on the white cuff. We also have a Baby Boy Stockings in this design. What if I need more of these Christmas stockings in the future years?